My eyes opened at 7:30am on Monday. I don't normally wake up at that time but I was concerned. Captain G was moving on today. The Morton Bay forecast was for 25-30 knot winds (that's a lot) and dangerous waves of up to 3 metres. Captain G - who by now fancies himself an elite "solo sailor" - wasn't willing to wait until the forecast was better. He told me on the phone, "I can see what the weather is doing here and I can tell you its a beautiful day!". 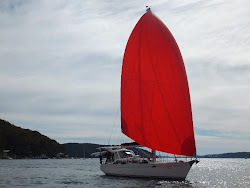 He left the marina about 10:30am on Monday headed for Deception Bay - still within the larger confines of Moreton Bay. The sail would take about 3-4 hours and he would cross the busy entrance to the Port of Brisbane. He called me a hour or so in to tell me he was crossing the channel into the port and motoring between two ships...one going out and one coming in. He had them on the boat AIS so they would know about him too - even if they hadn't seen him. The remaining journey was uneventful. He sailed some of the way and the forecast didn't eventuate. Cap G set anchor in the southern part of Deception Bay, made himself a lovely dinner of BBQ chicken & baked potato, carrots and brussel sprouts and was in bed early. He did say he had to listen to fishing trawlers going up and down the bay all night. Deception Bay, and in fact most of the northern part of Moreton Bay, has panoramic views of the Glass House Mountains. These are a spectacular series of steep hills - which are defined as steep sided volcanic plugs - formed from long ago volcanos. Frm Flickr - Glass House mountains from land - they look really spectacular from the sea. The next morning the forecast was just as bad for wind and waves....and again Captain G stuck his head out from the cockpit and said the day was, "perfect!". Departing from his southern most point he tried to steer directly up the bay but found it uncomfortably shallow in the swell. So he moved into the spitfire channel which runs along Bribie Island and leads out to the sea. When he cleared land a bit the head sail went up and away he went sailing at an average of 6 kts all the way to the Mooloolaba river entrance. As forecast the waves were big and breaking at the river - as well as his port side beam. Captain G had to time the waves, wait for the right break and then - in his words - he gave the engine, "THE FULL WELLY". That means he went fast in through the breakers and into the safety of the river. Rob and Ian from the yacht club were on hand to help him tie up in the marina....and yet another successful solo sail was completed! Last night he met the other guys from the club cruise for drinks and dinner and today he had a walk around. Here are some photos .... they didn't turn out that well (he knows now the camera lens needs cleaning!) but you get the idea of the area. The headland at the Mooloolaba river entrance - from the beach. From the beach looking south towards the river entrance. The boardwalk along the beach into town. Beach is on the right side through the bush. Cap G also said there were Brush Turkeys all through this scrub. 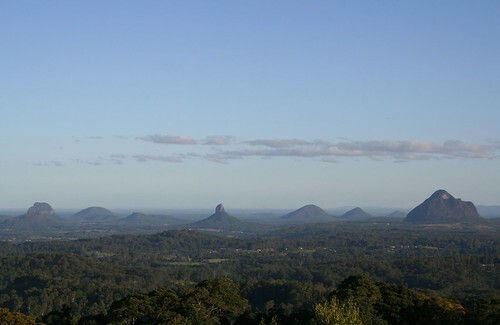 Photo of the Glass House Mountains taken along the way. Captain G and the other boats from the Yacht Club are having a rendezvous dinner tonight to talk about the adventure so far and the journey ahead. Hope its a great night! Me, I'm still at home with the "boot" and enjoying the tall tales from the sea!